Three new polls. CNN/ORC International, Quinnpiac, and Gallup/USA Today. CNN polled 402 Republican voters, mobile and landline, MoE 5. Quinnipiac polled 1,039 Republican primary voters, mobile and landlines, MoE 3. Gallup polled 946 Republican and GOP-leaning RVs, MoE 4. Long story short, Gingrich leads every poll, with a range of 22-26% support. Romney is in second in every poll, with a range of 20-22% support. Cain is in third, in a 14-17% range. Rick Perry continues to hang on at the brink, in a more volatile 6-11% range. In absolute terms, Gingrich’s lead is below where Cain and Perry were when they led, but that isn’t surprising as Gingrich leads a four way race, Cain led a three way race, and Perry led a two way race. CNN asked how Republicans would feel about each man being nominated. Every top candidate had good feelings: Cain +29, Gingrich +43, Perry +21, Romney +41. Those are great figures for Romney and Gingrich. 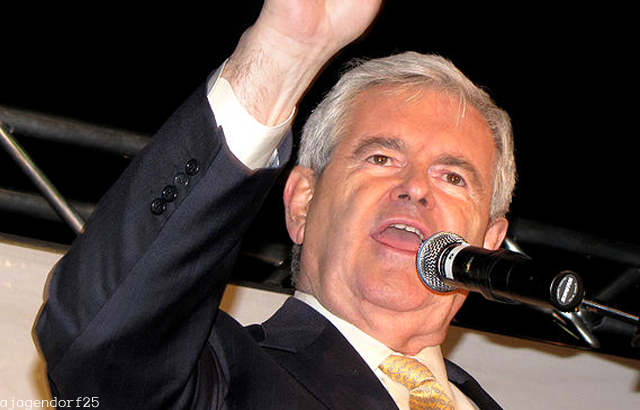 Should Gingrich hold on to that, he has a great shot at the nomination. Quinnipiac’s straight favorability story is the same. Among Republicans, Cain is at +23, Romney +43, Gingrich +54. The question was not asked about Perry. So again, I draw two conclusions: outside of the Internet bubble, nobody’s making this race out to be Romney vs non-Romney. Mitt Romney isn’t just supported. He’s liked. And right now, Newt Gingrich is supported more and liked more than Romney was, just like the advantage Cain and Perry each enjoyed for a time. Gingrich must survive the attacks that are already starting this week, if he wants to hold onto this lead. If he doesn’t, it’s going to be a mad dash by Cain and Perry to grab back at his support. Perry will need some of it in order to stay alive.